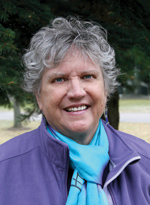 Marlyn James was the early childhood program director and the education department chair at Flathead Valley Community College in Kalispell, Montana. With more than 30 years in the early childhood field, Marlyn worked as a preschool teacher and center director and with infants and toddlers with developmental delays and disabilities. Marlyn presented workshops at the local, state, and national levels. She held a master's degree in human development from Pacific Oaks College. 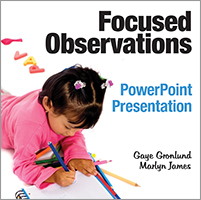 One copy each of Focused Observations, Second Edition, and Focused Observations PowerPoint Presentation. 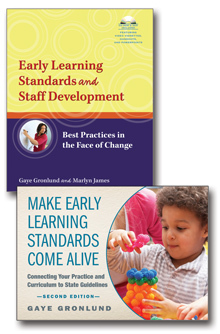 Save when you buy Make Early Learning Standards Come Alive, Second Edition and Early Learning Standards and Staff Development together! Intentional teaching begins with focused observations and systematic documentation of children's learning and development. 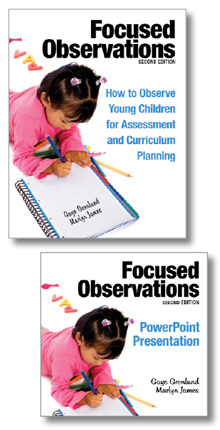 The book Focused Observations, Second Edition, explains why observation is one of the best methods to get to know each child well, track progress, and plan individualized curriculum. This CD-ROM—perfect for staff development and to use in early childhood college courses—includes a PowerPoint presentation which complements each chapter of the book, plus more information.